With only two move-in homes remaining at Eton, now is your last chance to take advantage of Fairborne‘s $10,000-off closing promotion. With homes priced from $374,900, this is a rare and affordabile opportunity to get in on Surrey’s charming and convenient Panorama neighbourhood. 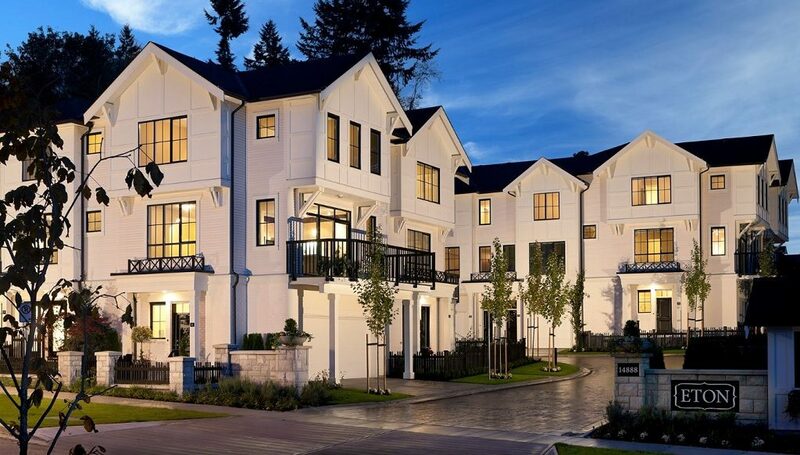 Among the two remaining units is the final D2 plan, a 1,410-square-foot three-bedroom plus den corner home with an open-concept kitchen and great room, three bathrooms including a master ensuite, a private manicured yard on the edge of the greenbelt and a side-by-side garage. High-end home features of both remaining Eton townhomes include double-thick granite countertops, kitchen appliances from Fisher & Paykel and Frigidaire, deep soaker tub and separate walk-in glass shower, tall ceilings and large windows. All Eton owners also enjoy access to a 3,000-square-foot resident’s clubhouse, complete with a fireside lounge with 16-foot ceilings, game-sized flat screen TV, communal kitchen, modern fitness studio, multi-purpose flex room and an inviting guest suite. Want to learn more? Visit Eton‘s new fully furnished display home at #53 – 14888 62nd Avenue (at 148th Street) in Surrey, open from 1pm to 4pm on weekends or by appointment during the week. For more information call 604 953 0833, email info@etonliving.com or visit the website here.